Why are so many workers leaving The Burlington Free Press? BURLINGTON - Mary Lake, 23, says she learned a lot during her one-year stint as a copy editor at The Burlington Free Press. "I worked with some of the best writers and editors I'll probably ever meet," she commented last week, a few days prior to quitting the paper. "The people there are very talented and hardworking, but they're just overwhelmed. I learned what good journalism is and also how a publication can be not nearly as good as it should be." Lake, a St. Michael's College journalism graduate, is leaving the Freeps in search of more flexibility, variety and a sense of personal achievement. She feels freelance reporting will give her all that - more of it, anyway, than her former employer provided. Frustration and alienation helped push the native Vermonter out the door of the state's largest daily. "What's going on at the Free Press doesn't make any sense," Lake declares - not angrily, but mournfully. "Everything they're doing is the opposite of what they should be doing to produce a great newspaper everyone can trust." The prime problem, in her view, is that the Freeps has "too many products and too few producers." The paper should either reverse its recent expansions or hire more staffers, but it is doing neither, Lake observes. In the past year, the Free Press has started publishing five free weeklies targeted to Colchester, Essex, South Burlington, Williston and Franklin County. Meanwhile, the paper is enlarging its freestanding weekend section and jazzing up its website with video and interactive elements. At the same time, it has been losing reporters and editors - lots of them. The Free Press has been without a managing editor since last year. Eleven newsroom employees - roughly a fifth of the paper's core staff - have departed in the past few months. Only a couple of those vacancies have been filled. The brain drain extends to other departments, too. The total workforce at 191 College Street has dwindled from 211 full-timers a year ago to fewer than 170 today, according to a current Free Press reporter who, like several others, agreed to speak only if guaranteed anonymity. The exodus could continue and maybe even accelerate in the coming months. "Everyone I know at the paper is looking for another job," Lake says. Another journalist describes the mood in the newsroom as "gotta get out while the getting's good." The reporter notes that it's better to be searching for a new position while you've still got a job. Fear of retribution - including firing - is the reason most often cited by half a dozen current Free Press employees for not attaching their names to their comments. Even some former newsroom workers worry about the repercussions of being identified. "It's scary to say anything because Gannett owns so many newspapers," says one reporter-turned-publicist. "I could be blacklisted if I ever tried to go back into journalism." The employment numbers supplied by an anonymous Free Press source cannot be confirmed. The Gannett Co., the Virginia-based owner of the Free Press, does not divulge payroll breakdowns for the 85 dailies in its stable. And Free Press Executive Editor Mike Townsend, designated by Publisher Jim Carey as the go-to guy for this story, declined to provide tallies of newsroom staffing. Townsend also would not comment on a hypothesis shared by many Freepsters, past and present, which might explain what's happening to the 180-year-old newspaper. "I'm not going to say they're wrong or right about anything in that respect. There's a lot about the economics of the media now that none of us understand," Townsend says. Gannett, the largest newspaper publisher in the United States, has a reputation within the industry for hypersensitivity to the bottom line. With 23 U.S. television stations and 17 United Kingdom publications also among its holdings, Gannett last year pocketed profits of $1.2 billion on revenues of $8 billion. Not too shabby. But the conglomerate's profit margins have been narrowing in the age of the Internet due to declining revenues from newspaper advertising and circulation. Meanwhile, Gannett's share prices have been tanking on Wall Street as investors fret over the future of old-school media brands. The company does say that its local newspapers' combined classified advertising revenue plummeted 13 percent in July. And Gannett's annual reports show that the Free Press' paid readership averaged 45,406 on weekdays and 52,008 on Sunday last year - 6000 and 10,000 fewer, respectively, than in 1998 when Chittenden County's population was significantly smaller than it is today. Free Press employees interviewed for this story generally believe the paper remains among the most profitable of Gannett's U.S. print properties. Rumor ranks it 6th out of 85. But none of the paid help knows for sure, because Gannett doesn't divulge earnings reports for individual papers to employees. Townsend isn't talking numbers, either. In order to maintain profitability in the face of diminishing revenues, the theory holds, the Freeps has decided - on orders from headquarters in Virginia - to squeeze expenses by leaving job openings unfilled and by chopping employee perks. As a result, the remaining employees are being required to do more work for the same pay. Some argue that their compensation is actually being reduced. The company's recent decision to stop paying for about 100 staff parking spaces is saving the Free Press as much as $100,000 a year, but it is costing employees several dollars a week in garage charges, meter fees and parking tickets. There's also resentment over management's rejection of a staff petition seeking an increase in the paper's 30-cents-a-mile reimbursement rate for work-related car travel. The Free Press doesn't pay for reporters to attend professional development conferences. And until a few months ago, "there was this guy who went around turning off lights all over the building," Lake notes. "It was pretty funny because he'd often turn them off in the men's room when someone was in there." 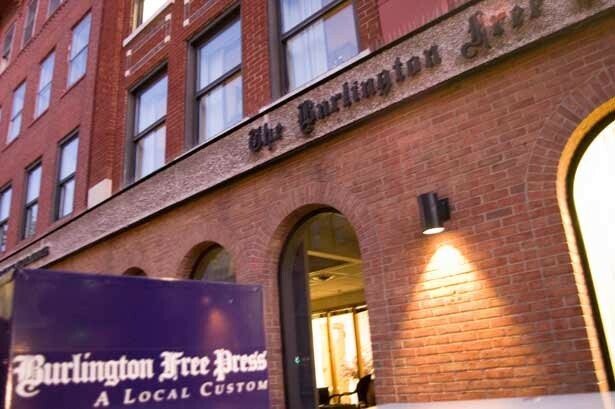 In addition to sapping morale - which one veteran reporter describes as "the worst I've ever experienced at a newspaper" - this corporate penny-pinching is damaging the quality of journalism at The Burlington Free Press, according to newsroom sources. With fewer reporters and editors expected to generate and process ever greater amounts of content, "It's inevitable you're going to rely more on press releases and wire copy," the same reporter says. "This paper is broken. There's no real desire to improve." The greatest loss from the new order may be stories that never get written. "There's less in-depth reporting because the paper can't pull anyone off their regular beat and give them a couple of weeks to develop an analytical or investigative piece," says one Free Press reporter. The paper also can't adequately cover important beats, this source adds. No reporter is assigned full-time to Fletcher Allen Health Care or the Burlington school system, for example. The Free Press also no longer maintains a year-round bureau at the State House in Montpelier. Short, light and fluffy is now seen as the ideal form of newswriting at the Free Press, according to some reporters. At a newsroom strategy session, one reporter says, Carey held up a copy of People magazine as a model the Free Press should be striving to emulate. The Freeps' overseers in Virginia don't show much concern for journalistic standards, suggests St. Michael's journalism professor Traci Griffith. "Gannett is a corporation first and foremost," she observes. "It just happens that this corporation does news. It could just as easily produce potato chips." But potato chip makers don't have the special responsibility to the public that newspapers are supposed to have, Griffith adds. "If journalists want to hold onto all that's said in the First Amendment, we've got to accept the responsibilities that go with it," she declares. Griffith is referring to the press' historic role as a monitor of powerful interests and a champion of the right to know. Griffith does concede, however, that the forces buffeting Gannett and its franchises are raging throughout the entire media industry. Free Press employees are hardly unique in experiencing cutbacks and "speedups." Hundreds of journalists have been pink-slipped at major metropolitan dailies in the past couple of years. A newsroom source says Freeps publisher Carey has mentioned layoffs as a possibility. Gannett doesn't deserve to be singled out as a cold-hearted villain, suggests Mark Jurkowitz, associate director of the Washington-based Project for Excellence in Journalism. A decade ago, he says, some journalists did denigrate Gannett as profit-obsessed while extolling The New York Times Co. as "the best steward of newspapers in the country." But the turmoil in the ink trade unleashed by the rise of electronic media has changed all that, Jurkowitz adds. "It used to be that the good guys and bad guys were easily discerned. Now, some of those distinctions have gotten blurred," he says. Gannett is also not alone among legacy media companies in responding to a shifting, shaking industry landscape by experimenting with unfamiliar forms of information packaging and delivery. In fact, the company has ventured more boldly than most newspaper chains into uncharted terrain. The Free Press' enhanced emphasis on local news is in keeping with one of Gannett's chief tenets for success in the 21st century. It assumes that most readers can easily get national and international news from Internet sites but have much greater difficulty in learning from the web what's happening in their own communities. And media consumers do hunger for local news, Gannett believes on the basis of marketing surveys. The company thus sees intense localism as the key to continued prosperity. On most days, therefore, the second page of the Free Press' Vermont section is divided into four parts, each devoted to a particular community. This so-called quad contains stories and photos about Colchester, Essex, South Burlington and Williston. Many of the words and images will later be "re-purposed" for the free weeklies distributed to all suburban households that do not subscribe to the Free Press. "The quad is an example of marketing driving the paper rather than news," says a former Free Press reporter who tracked the towns. "It's all about advertising. 'Fill the quad, fill the quad,' we were always being told. But it may well be that there's no real news coming out of Essex, say, on a given day. So what are we going to do? Put in a picture of someone's dog?" Shots of pets do occasionally make their way into the quad. And the slot reserved for Colchester was recently filled with a preview of a local Wiffleball tournament. The ultra-local approach embraced by the Free Press also features come-ons to readers to "get published." The practice of encouraging town residents to write their own news stories is sometimes referred to as "citizen journalism." But to one former towns reporter at the Freeps, "It's not good journalism. It might not even be journalism." Gannett's vision of newspapers as relentlessly localized in their content involves a greater reliance on journalistic technology. The company wants reporters to spend full days in the field, equipped with an array of digital devices that enable them to post stories and pictures directly onto the paper's website at almost hourly intervals. These mobile journalists are referred to as "mojos." The Free Press has tried to develop its own squadron of mojos, one reporter recounts. "We got trained in shooting video, and we were all given laptops so we could file from wherever. But there's not been much follow-through. The website is getting more and more glitzy, but it's in-house techies who are driving that, not so much the reporters." For all its faults and struggles, there are many positive aspects of the 2007 incarnation of The Burlington Free Press, according to several current and former journalists. Not surprisingly, those offering favorable assessments are much more willing to be quoted by name. Doreen Wright, for example, says she had no major complaints during her 35-year, mainly copy-editing career with Gannett - 22 at the Free Press and 13 at USA Today, the company's trendsetting national daily. "The only reason I left was to get a life change," says Wright, who has been working at the Essex Reporter for the past two months. "I like being on the day shift, Monday to Friday." Jeff Dickinson, a graphic artist who left the Free Press in June after 10 years, sees Gannett simply as "a business that's trying to find ways to continue making money." The company is putting considerable effort into website development, he says, "because that's where advertising revenues are growing. What's wrong with that?" Dickinson also challenges the charge that the Freeps seldom reports in-depth. Reporters Candace Page and Molly Walsh both write those kinds of stories, he says. The currently high rate of attrition may indicate nothing exceptional, Dickinson proposes. "The Free Press has always been a starter paper for most reporters," he says. "Young journalists work there two or three years, they get some experience and then they move on. " Mike Donoghue, a sports reporter who started filing for the Free Press in 1968 while still in high school, agrees that the spiking turnover may prove to be of little significance. The paper has experienced spates of resignations in the past, Donoghue recalls. And those exiting the newsroom in recent months had a variety of motives, he points out. Some were lured away by offers of higher pay in marketing or public relations; others left Vermont because a spouse was relocating; a few simply reached retirement age. And at least a couple of former Freepsters are eager to return, Townsend says, noting he's received resumes for copy editor openings from ex-employees. It isn't as though newsroom jobs are hurtling toward extinction, Townsend adds. "There's no end of the road for local news," he says. "There's also an incredible hunger for sports coverage." Staff morale isn't so bad, Donoghue says. "I'd describe it more as a wondering attitude - people wondering what the future will hold." Journalists at the Free Press and elsewhere do have good reason for feeling insecure in their jobs, Donoghue acknowledges. "It's all a little scary when you see hundreds of people nationally being laid off." Would the situation be different if the Free Press were owned by locals, rather than a conglomerate with 50,000 employees? Probably not, says Griffith of the St. Mike's journalism department. "It's such a tough climate out there now, I don't know how a locally owned business could cope better than Gannett." Jeff Pinkham, who left the Free Press in June after eight years as a sports reporter, now writes for a newspaper with an ownership arrangement that some journalists would view as ideal. The Idaho Falls Post Register has been employee-owned for almost a decade. So it's a better place to work than the Free Press, right? Pinkham isn't sure about that. "There's less red tape here," he says, "and we can change direction more quickly than a paper owned by Gannett. But I've only been here a month. Ask me how I feel a year from now." Kevin J. Kelley teaches journalism and English at St. Michael's College. Mary Lake is a former student. Donoghue and Griffith are colleagues.